Today, I want to discuss how entrepreneurs can do business – and create success and freedom – on your own terms. Let’s begin by talking about assumptions. I want to share a story with you. This morning, we arrived at the studio to film BernadetteTV, and it was clear, blue skies and plenty of sunshine. I immediately saw it as a wasted opportunity – we planned on being indoors all day, filming, so we wouldn’t be able to take advantage of the beautiful day. We entered the studio and got to work. And while we were filming, as often happens in Ireland, the skies became dark and overcast. Wondering what this has to do with doing business – and achieving success and freedom – on your own terms? I realized I was making assumptions. We always film IN the studio. So even though the weather as really nice outside, because we “always” film indoors, we have to carry on filming indoors. Right? You see, in business and in life, we get into patterns where we end up doing things not because we choose them, but because we’ve gotten into the habit. 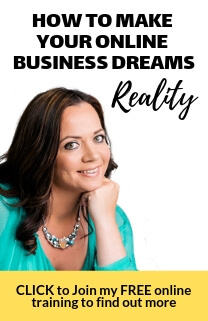 In coaching people to grow their business into the kind that really works for their life, so they can enjoy the freedom they’ve envisioned for themselves, I’ve seen over and over that they stop themselves with the assumptions they make. So I ask you: Are YOU operating under assumptions? In particular, under the assumption that you can’t have it all, that there has to be some kind of compromise? The Number One challenge that stops people is our own thinking! I want to help you break out of that. Which clients would you work with? How would you deliver your products and services? In person, one at a time, in groups, online? What type of business do you want? A huge global empire, or a simple business that allows you to reach lots of people? There is enough technology and assistance out there that any of us can create the business we want, exactly as we want it. I really want you to grasp this opportunity and recognize that you, too, can have it all – exactly how YOU want it! God doesn’t give us our dreams without the ability to make it possible. So the business you’re dreaming about, the one you crave, is exactly the business you’re meant to have. And when you have it – well, that’s when you’re going to show up and shine in the best possible way, make the biggest difference, AND enjoy the freedom you deserve in your biz and your life. So what’s the first step in creating your dream biz? You have to get really, really clear on what you want! The money you’re making, the clients you’re working with, the products and services you’re selling, and the amount of hours you’re working. Write it down as if you’re crafting your order for the perfect business. Next, identify the first action you can take to align with this vision… to make this happen. It only has to be one step! Just that very first step. Then, repeat after me: I claim it all. I choose to build my business on my own terms. I can have what I want. I’d love to hear your stories about success on your terms. How did this resonate with you? Share in the comments below! your business and your life. Today we’re talking about how to do business on your terms. nice spot and find a nice outdoor spot where we can do an episode of Bernadette TV. business that really works for their life. can’t have it all, that there has to be some type of compromise. you break out of that thinking. Who would be the clients that you worked with? What would you be delivering to clients? be delivering information over the internet and never even speaking to a customer? travel in my business model. because I think God doesn’t give us our dreams without the ability to make it possible. best possible way. That’s where you’re going to make the biggest difference. working with, products or services, the amount of team. Think about your working hours. do business on my own terms, I can have what I want.